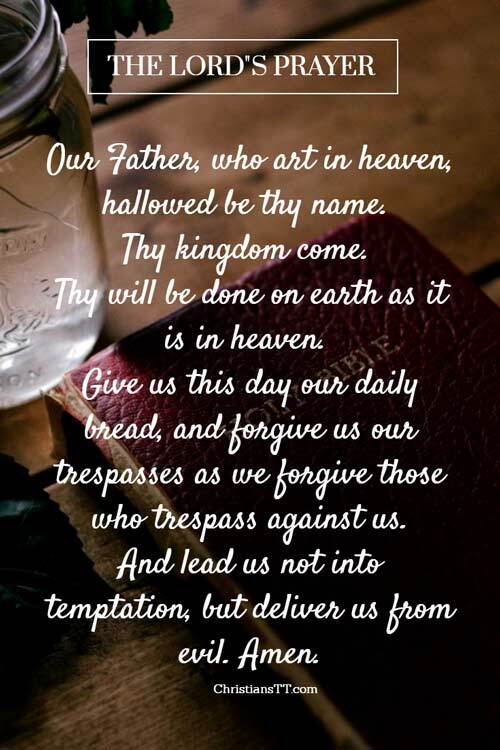 Found in Matthew 6:9-13 and Luke 11:2-4, the Lord’s Prayer is the most recited and sung prayer of all times. One of the first prayers taught to Christian children, the Lord’s prayer has also been converted to song. When did you first learn the Lord’s prayer? How often do you pray it? Here is two year old Zoei Toh singing the Lord’s Prayer! Thank you for your shield , guidance, and your everlasting love oh merciful father. Daily my family and I fall short on a daily basis. Guide us as we walk through this wicked world. Bless us with more prosperity in Jesus Mighty Name. So be it… Thank you for your daily verses! Thank you oh heavenly father. Continue to watch over my family and I with your love and protection. In Jesus mighty name . Amen so be it! This prayer is wonderful and was said in most of the schools in England each morning before lessons started. It is the Matthew text which is used. It was always the most important part of my school day, to stand in the Assembly Hall with all other students and recite this uplifting prayer after the singing of 2 Hymns. Since being born again ten years ago this prayer has had new meaning for me and I see the clear instruction in the words more clearly than I ever did. This is truly how God would like us to pray. Thank you Lord for Your divine instruction left for us before we were even born. Thank you again for your prayers.Yesterday I was informed that Cambridge Conservatory of Music was putting me off until September now because the music students were now involved in sports and stuff so now I am facing buying a car because I need it and I have a bank appointment tomorrow without income now from that job. I am still an organist and have some income. I need a MIRACLE. Oh! I am trying to be positive . It helped to read the excerpt on the lady and her list of positives and negatives of her job. I might be in those same shoes. I have only worked for the Conservatory two months. God know my dream. I pray for all this chaos to stop and that I have security once and for all. I have not had that my whole life. But I trust God. He makes me a light in the world anyway. My smile draws people to his light in me. Heavenly father, we ask your blessings upon Kae. Give her the faith to follow your word and be strengthened by your love and to rested assured that you will take care of all our needs. In Jesus name, Amen! Why is the Lord’s prayer not finished with “For thine is the kingdom and the power and the glory, forever, amen”. Diane, there are two versions of the Lord’s prayer listed here: Matthew 6:9-13 and Luke 11:2-4. The text uses Matthew 6:9-13 which includes “For thine is the kingdom and the power and the glory, forever, Amen”. The image uses Luke 11:2-4 which does not include this ending.